First, the coffee. 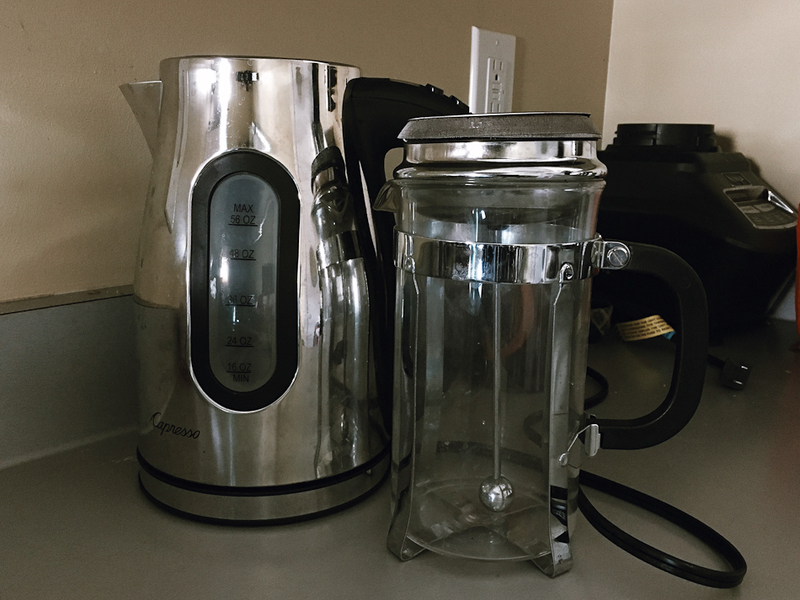 If it’s a day with a bit of time, use the french press, and the tea kettle to boil the water. Just the right amount of cream. 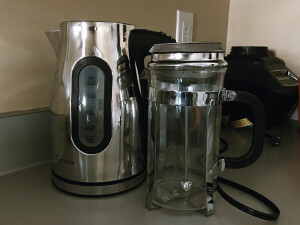 Pour in the mug and set aside so it can cool to the perfect temperature. While that cools, you mix chemicals. I’ll use a gallon of filtered water I’ve set out at room temp to mix them up. Precise measurements in a graduated cylinder of the raw chemicals before dilution. HC-110 first, then white vinegar for the stop bath. The fix is almost always ready, unless it’s close to exhaustion and I have to make up a new batch. The film comes out, and then in to the dark bag, and out again inside the tank. The proper selection is made from the Ultimate Dev Chart, and the times are followed. In between agitations, the coffee is consumed. After the film is done with its dance, and dry, it is scanned as the weekly words are written. Lightroom makes its appearance in the process. Then the words and photos are uploaded. Once that is done, a camera is loaded, and it is lunch time. Over lunch, the merits of bicycle ride or hike are discussed. Then the merits of this or that trail. The camera is slung, the spare rolls put in pockets or a bag, and then we walk to the 4Runner to begin the days adventures outside. And somewhere, pedaling or putting one foot in front of the other, there will be less tension, less stress, and life will right itself again. We will drive home in the 4Runner, sweaty, hungry again, but better. There may be another meal stop, but then we go back to the house, ritual complete. The next weekend will be upon us soon, and our ritual will begin again. As close to church as we ever come, more needed than most rituals to keep our sanity.